BUXTON — School nutrition departments across the state work hard to make sure children are receiving healthy meals while at school, but that work does not stop in the summertime. SAD 6 is among the Maine districts providing free meals this summer to children through the USDA Summer Lunch Program. Breakfast will be available throughout the week now through Friday, Aug. 10, at Buxton Center Elementary School, 915 Long Plains Road, from 8:15 to 9 a.m., at Edna Libby Elementary School, 45 Fort Hill Road in Standish, from 8:30 to 9:15 a.m. and Jack Elementary School, 15 North East Road in Standish, from 8:30 a.m. to 9:15 a.m. Lunch is available at Buxton Center school from 11 a.m. to noon and at the Libby and Jack schools from 11:15 a.m. to 12:15 p.m. Otter Pond YMCA, 71 Chadbourne Road in Standish, will offer breakfast from 8:45 to 9:30 a.m. and lunch 11:45 a.m. to 12:45 p.m. through Friday, Aug. 24. Breakfast (8:15 to 8:45 a.m.) and lunch (11:30 a.m. to noon) is also available Monday through Thursday between July 9 and Aug. 9 at Bonny Eagle Middle School on 92 Sokokis Trail in Buxton. Breakfast (8 to 8:45 a.m.) and lunch (11:15 a.m. to noon) will be served Monday to Thursday through Aug. 9 at Emery Jr. Memorial School at 908 Cape Road in Limington. Dorothy Janotta, food service director for the Bonny Eagle School District, said many of the meals are handed out to participants in the district’s summer academy, extended school year or recreational programs, but any child in the district is welcome. Janotta said last year the Bonny Eagle meal sites served 27,000 meals. “There are no eligibility requirements. We are what they consider an open site, so all kids 18 and under can come have a meal,” Janotta said. Maine Department of Education Child Nutrition Consultant Adriane Ackroyd, who oversees the summer meal program across the state, said open sites operate in places where at least 50 percent of the students qualify for free or reduced lunch during the school year. “I, personally, am thankful that I have a staff that doesn’t mind working in a hot kitchen throughout the summer to make sure kids do have access to meals,” Janotta said. As is the case during the school year, the summer meals, made possible through funding from the United States Department of Agriculture, must adhere to a series of nutritional standards and include fruits and vegetables regularly. Food allergies and religious beliefs also are taken into account. In 2017, 438 summer meal sites across the state served more than 754,063, an increase of more than a thousand from summer 2016. Ackroyd said so far 123 sites have signed up, but expects a few more to start up throughout the summer. Michael Kelley can be reached at 781-3661 x 125 or mkelley@keepmecurrent.com or on Twitter @mkelleynews. 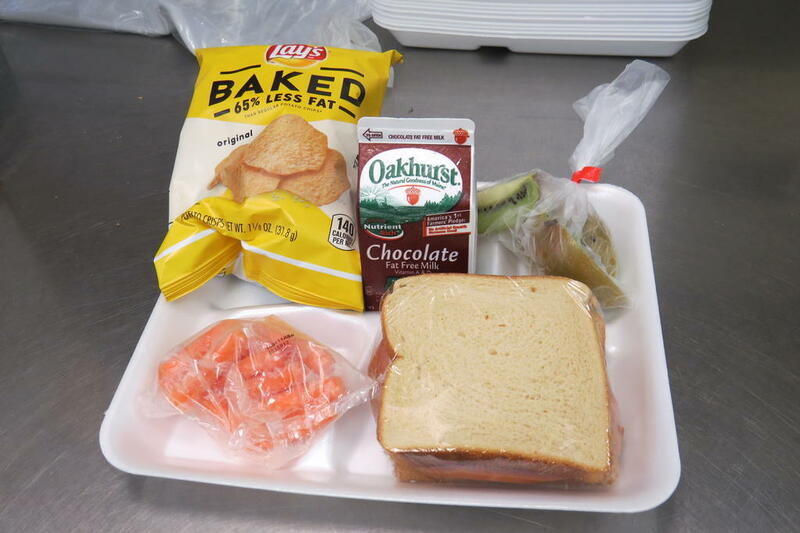 Under the guidelines fo the USDA Summer Lunch Program, lunches, like this one prepared recently by the Westbrook School Department, must adhere to a series of nutritional standards and include fruits and vegetables regularly.